The carpets of petals on the ground and turning the burn white at Glenarn show what a great flowering season we have had. The principal show of colour is passing now, with the late reds of Rhododendron ‘Tally Ho’, ‘Review Order’, facetum and griersonianum and some pale decorums still performing and scenting the garden. To replace flowers we now have soft furry rabbit’s ears or purple bronze spikes of new leaf growth to provide a second show. And the maddenia rhododendrons are just starting. These are a family of tender, scented, generally white flowered plants whose flowering season runs from mid-June to late July. At the moment we have Rhododendron crassum in full flower in huge lily-like trusses and Rhododendron brachysiphon a subtle white truss with pink marbling and bright pink calyxes. 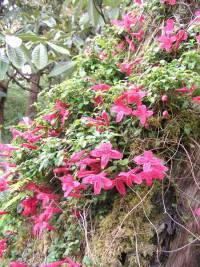 By the biggest sinogrande at Glenarn is Rhododendron polyandrum, a broad spreading bush originally from Achamore Garden on Gigha that has huge fleshy pink flowers unlike any other and rather over the top! To punctuate the overall layers and shades of green-ness, the Chilean flame tree, Embothrium coccineum flowers through the garden, with Crinodendron hookeri, the lantern bush – the pendant red ‘lanterns’ buzzing with honeybees collecting nectar. The bee line across the vegetable patch from the hives to the tall Crinodendron hedge can make working at the bottom of the vegetable garden difficult – the guard bees think you are an obstruction to be removed! But the seeds and vegetables are now all sown so apart from weeding and feeding we can leave this area to the bees. Philadelphus, the mock orange, is everywhere with starry white flowers and olearia, the New Zealand daisy bush is much in evidence on Sunnyside, with the largest tree forming a backdrop to the new planting in the Rock Garden. Here, combinations of creamy camassias, tall iris, alliums of various shades of purple and meconopsis, the Himalayan blue poppy, are successful, if short-lived. Primula ‘Inverewe’, a tall brick red candelabra primula which does not set seed has formed a huge clump and catches the eye at the Rock Garden gate – but there is much to be done in the surrounding area where we took out a tall rhododendron with a large root plate. The tall monocarpic meconopsis are flowering too, the yellow and pink spikes of Meconopsis nepalensis and later Meconopsis wallichii in pale blue. While there are only a few magnolias now in flower, Magnolia globosa, the hen’s egg magnolia is worth a look as the flower remains as a tight oval for some time before finally opening. We wait for the flowers of Magnolia rostrata, the cover photo of our garden leaflet for 2013, usually out by early June. However, the gigantic helicopters of fresh leaves make up for the shortage of flowers. It’s been a beautiful flowering season but strange how some plants are at least 3 weeks late while others are up to speed. Last week is the first time that the soil has felt warm – weeding in the vegetable garden I could really feel that the plants were beginning to grow. It has been a hard spring, continuing cold long after normal, even into June with a couple of short warm spells. The positive side is that all the flowers have lasted a long time and generally have been 2 weeks later than average, for example Rhododendron ‘May Day’ is still in flower mid June! So now we are at the summer solstice and growing should be at its peak – as yet the vegetables don’t reflect this aas seeds take a long time to germinate and sweetpeas, runner beans are still to start climbing properly. But potatoes and others tucked into the ground are certainly growing and I reckon our first earlies should be ready in July. There is plenty of colour in the garden – the luscious late red rhododendrons are just starting to flower and these with the beautiful R dicroanthum family – all shades of orange and amber provide the backbone, with the showy remains of R loderi and R yunnanense frothy white in the glen. There are bright red flashes of embothriums and the lanterns opening on the Chilean Crinodendron hookeri. I have been working hard at the pond this year, adding new plants that the deer will not eat – I spent a long time in January and February looking at catalogues and choosing from plants they are said to dislike – alliums, primulas, euphorbias and those with felted or grey foliage – at present it is working but of course it doesn’t stop them breaking foliage by walking over it! The iris at the water’s edge should make a show this year and the rheum is already over 2m high. Mike has planted lots of new trees – acers, rowans, hydrangeas and rhododendrons in the last 2 months – a great advantage of a wet spring! It all seems to be surviving, protected by long wire cages from the deer. The rock garden is now into its early summer flowering, with the tall white camassias so beloved of the bees in full flower together with alliums, meconopsis and tree paeonias – these have flowered for at least a month. The tall biennial Meconopsis nepalensis are looking good, the tallest 2m high from a huge rosette of leaves. I am trying to remove the standard blue aquilegias and leave only the pinks, white and very dark purples to seed. I would like them to spread into the rough grass behind the main bed to add colour. At the moment, Clematis wilsoni scents the rock garden with chocolate as it scrambles over 2 large rhododendrons shocking pink in flower, creating a white waterfall effect. To come in the next couple of weeks the first roses – ours are generally large species roses, many scrambling up trees to over 10 m and providing an element of surprise while avoiding being eaten by the deer! I especially love Paul’s Himalayan musk, a lovely pink. A tiny rose already in flower is Rosa farreri, known as ‘Reginald Farrer’s threepennybit rose’ – the pink flower is just the size of the old coin and the leaves are the smallest of any rose I know. The rock garden will move towards summer proper with verbascums, ligularias, sanguinarias, lilies and later alliums making a fine show.